To all our dear travelers, clients and friends! We are Marc and Mieke and we are happy to share with you this place of traquillity in which we live. During a stay at the Casa Rural Fuente la Teja we will welcome you and provide you with all the comforts to make your stay enjoyable. We can provide a wide range of traditional cooking on site. So you can eat in the restaurant and chill in the bar or lounge. A visit to this country house is a dream for those who enjoy the rural and natural environment. Here, in a privileged situation in the Sierra Nevada, you will be able to forget the noise and stress of everyday life. Casa Rural Fuente la Teja (Fountain Teja) is an authentic and rustic building which has been lovingly restored to provide accomodation in the main house and in a separate cottage. All the accomodation has full central heating for those colder months in the mountains and each room has its own bathroom and tv. Take a further look at the interiors on our Hotel Rooms and you will see that all the rooms are themed and named after local plants and herbs to add to the natural feel of the visit. The site has ample free parking, a large garden and pool for the children. Around the casa rural there are many activities to take part in, horse riding, cycling or walking – or you can just sit under a shady tree and enjoy the tranquility. Evenings can be spent around the pool or just gazing up at the night sky. If you want to take a deeper look into the universe we have the sky for it and we can arrange for telescopes to be on site. The local area includes the pretty village of Güejar Sierra and the Sierra Nevada trails which can be walked or cycled. Being only a 40 minute drive from the beautiful and historic city of Granada, the visitor is also able to enjoy this Spanish city with its wonderful culture and atmosphere. Enjoy a visit to the Alhambra or take a stroll around the old arabic streets of the Albaicin. If you want a taste of the tropical Granada coast, it is around 40 minutes away and during the winter months a visit to the ski resort of the Sierra Nevada is around an hour away. Here at Casa Rural Fuente la Teja we offer guests our home and a personal and quality service. 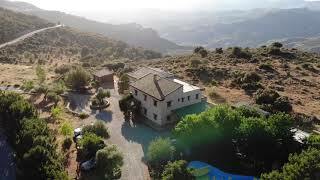 Come and stay with us and share our wonderful piece of paradise in the Guejar Sierra, Granada. Casa Rural Fuente la Teja awaits you.